Yes, this is a real picture from my youth. My uncle Chuck deserves the photo credit from documenting this amazing moment. 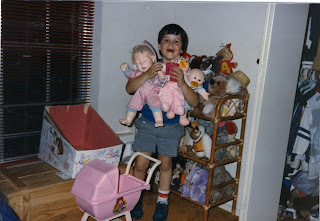 Now that I'm having a daughter, I wished I would had saved my dolls and stuffed animals, but I think I got rid of them once I realized all other boys I knew did not play with dolls. In addition to a juice box, I'm holding my boy and girl twin newborn babies (foreshadowing?) but my favorite doll is the big one I'm holding on my right. It was designed and weighted to feel like a real baby. A real baby is something I will have in my hands in a few months. Actually, I will have two real babies...good thing I spent the first seven years of my life practicing. You are just precious in that picture!!! I love the joy on your face, the dolls you loved, and your missing front teeth. Love you so much!